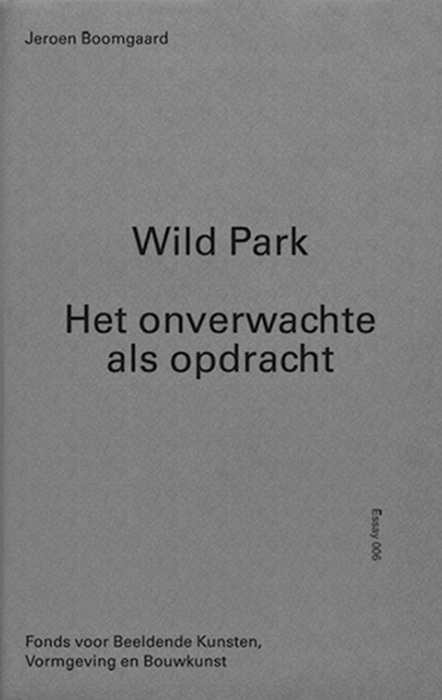 The sixth essay published by the Netherlands Foundation for Visual Arts, Design and Architecture (Fonds bkvb), titled Wild Park: Het onverwachte als opdracht (Wild Park: The Unexpected as Commission) and written by Jeroen Boomgaard, expounds upon the thorny subject of art in public space. Thorny because art in public space is marked by constantly changing administrations, conventions and ideas regarding its role and function. This has not always led to the best art, and certainly not to a cohesive collection. The eclectic and heterogeneous quantity of sculpture in the Netherlands is overwhelming and often difficult to interpret. The essay begins, however, with an introductory chapter on animal figures in public space. Nowadays we see more animal than human representations; they are more neutral than people and unlike modernist art, for example, have no programme or agenda. When clear, collective ideals cannot be expressed, animals are an easy solution because of their ‘empty anecdotic’ nature. Animals in public space reflect a postmodernist avoidance of meaning and, caught between the divergent interests of commissioners and makers, they constitute an escapist gesture. This gesture can generate unexpected meanings. The ‘where’ of art in public space is a complex question. The public nature of what we once called ‘public space’ is steadily diminishing and is increasingly being surveyed, privatized and commercialized. Because the public nature of space is becoming blurry, we have more need to make it concrete: to transform the undefined space into a defined place. Converting space into place, or ‘solidifying’ as Boomgaard also calls it, can, for instance, be done through the installation of a work of art. What’s more, this is also a way for power to manifest itself, to claim a place, a restructuring project, new building or construction site. The making of such a claim used to be easier than it is now: the ruler was simply put on a pedestal. Nowadays we are confronted with a complex, composite power of government, public and private parties. The democratic exercise of power has led in the worst cases to compromise art (the result of the consensus machine) or meteor art (which lands on earth out of nowhere). But there are also good examples of works that function as unreliable signals of power, as jammers. This, according to Boomgaard, is the most important task of art in public space and also the reason why commissioners are fond of roundabouts, for these places, after all, strip the works quickly and efficiently of their power. All the same, wherever sculptures end up, they are seen by people. That seeing is not always on purpose, often it’s accidental and sometimes even unwanted. The audience for art in public space is ‘always present and never demonstrable’. That makes it an ungrateful audience and an uncertain factor that is difficult to allow for. Community art attempts to calculate in this uncertain factor through the active participation of the public. Since the mid-1990s, participation projects have been launched as a palliative for disrupted districts, alienated population groups and painful rebuilding trajectories. This has led to ‘an overwhelming amount of depressing participation art’, but also to successful projects that manage to avoid the paradox of the invisible audience and find a balance between too little and too much participation. Boomgaard concludes by stating that the elitist, educative perspective in which art is served to public space like cod liver oil for a healthy social body is no longer the norm. But then, what purpose does art in public space serve? For Boomgaard, works of art in public space are a kind of mirror of the health of our democracy. ‘A poorly functioning democracy brings forth bloodless images commissioned by leaders who do not want to take any responsibility for their lack of ideas and pass the buck to citizens in a half-hearted attempt at participation without any real chance for change.’ Strong works, on the other hand, ‘show a government that is prepared to offer space to deviation and experiment and that considers precisely that space to be the representation of its presence’. This last observation has a sharp edge to it, which Boomgaard does not directly address. For we can ask ourselves whether giving room to the unexpected isn’t in essence a sly tactic of annexing, whereby enemies and fault finders become part of the system. This paralyses truly critical potential, undermining its power and rendering it harmless. Expect the unexpected, that’s the paradox.